The Mitsubishi M2M delivers affordable, global. end-to-end IP data connectivity in industry sectors such as environmental monitoring, SmartGrid, pipeline monitoring ,machine monitoring, mining, water utilities. telecommunication, building and facilities management sectors. The solution is built on the MAPS SCADA and the Mitsubishi FX3fl./O series PLC’s for both control and data acquisition to and from remote sites. The Mitsubishi M2M solution provides remote communication with the PlC without the presence of an on-site technician. 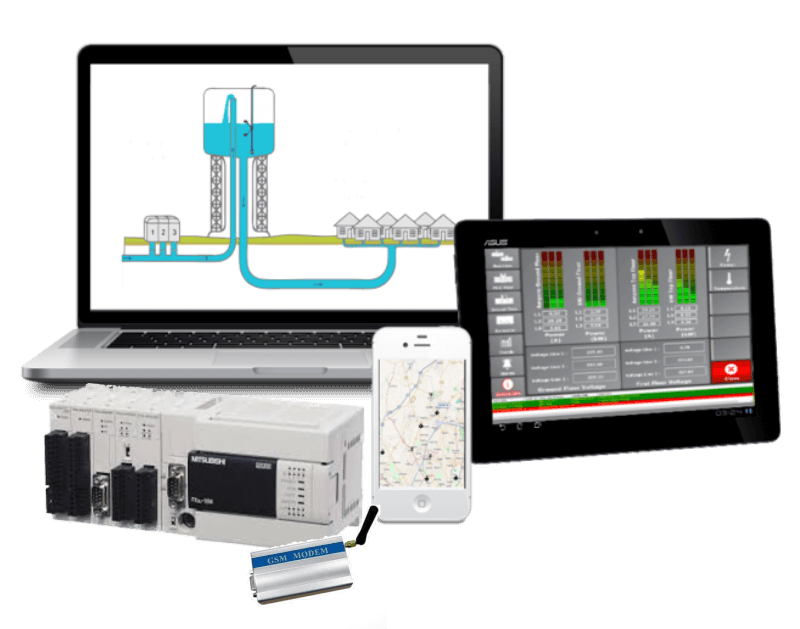 The operator can monitor and control an individual or group of devices through the MAPS SCADA interface. This solution can also allow a technician to do PlC programing over the air to the M2M device. No need for the technician to go out to site to do a program change. The intelligent M2M driver in MAPS automatically monitor the connection between the MAPS ljO Server and the PlC in the field, without the need to poll or establish a connection to the device. The Operator will be notified if the link goes down. The Operator will also be notified when the comms link is healthy again. Diagnostics and management information on communications is available for any device on the M2M network. The Mitsubishi M2M solution does not require a fixed IP or Dynamic DNS middleware. This means you can use this solution on any GPRS network and not require a static IP from your ISP I Internet Service Provider). The only fixed IP required is at the MAPS ljO Server. The Mitsubishi M2M offers efficient communications with cost effective data transfer costs. The PLC can be configured to send data on a time interval,when storage buffer limits are reached or manually polled. Event and Alarm data is transmitted to the SCADA immediately. Communications can be set to live mode which will show real time data as the site changes.